Britt Bass’s life is filled with subconscious inspiration. She spends time outside letting herself be inspired by the movement the breeze creates on water or by vibrant colors in the trees. During her travels, she doesn’t bother scripting out the day-to-day. She prefers to let her destination direct her agenda, taking photos and filling her sketchbook as she goes. 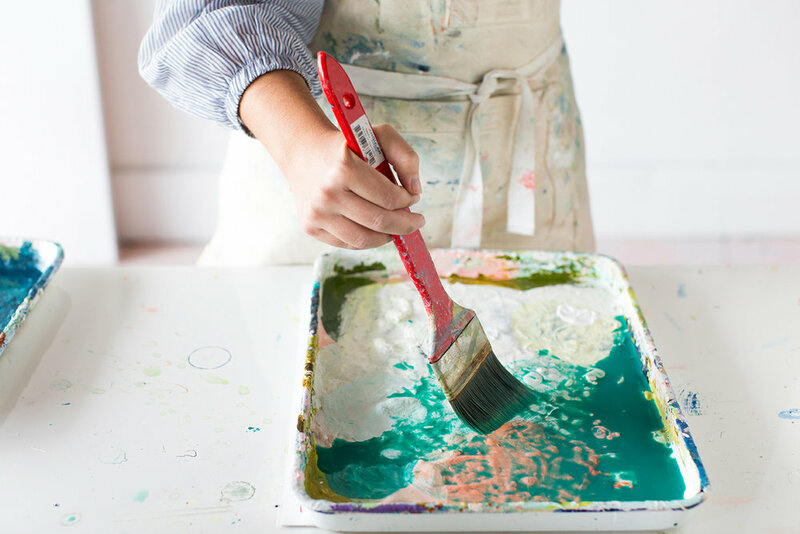 When the time to create comes and a blank canvas is in front of her, she takes time to intentionally remember these scenes and experiences that have inspired her and channels her real life into art. Britt Bass is an abstract artist in Roswell, Georgia known for her playful and vibrant work. Her pieces show her love for texture, color, and design. Art has always been an integral part of her life, starting with the influence of her mother. “She is the foundation of the common line of art and creativity throughout my life,” Britt explains. Britt recalls times sitting in her mother’s sewing workroom, making pillows for her dolls or cutting out shapes in pieces of fabric with her sisters. It was here that she first learned the satisfaction of creating something beautiful by hand. She carried this childhood passion through her young schooling, leaving such an impression on her art teacher that she pulled Britt’s mother aside and said, “Britt is going to be an artist when she grows up.” Little did her mother know that Britt’s studio would someday be right next door to her own. The assured confidence people like Britt’s mother and teacher put in her budding creative abilities carried her as she pushed herself to study art in college. It was during a paint theory class when Britt began to think about color in a new way. Her professor remarked that everything has its own color palette, and Britt found herself finding unique color compositions in nature, photographs, and ordinary objects. As she learned to pair and assemble colors herself, she fell in love with the effects of color and started to value its influence on her own work even more. “I’m always analyzing color. Constantly thinking about what colors will look good, mixing, holding them up to the canvas and seeing what will work. It’s a lot of trial and error,” Britt says. 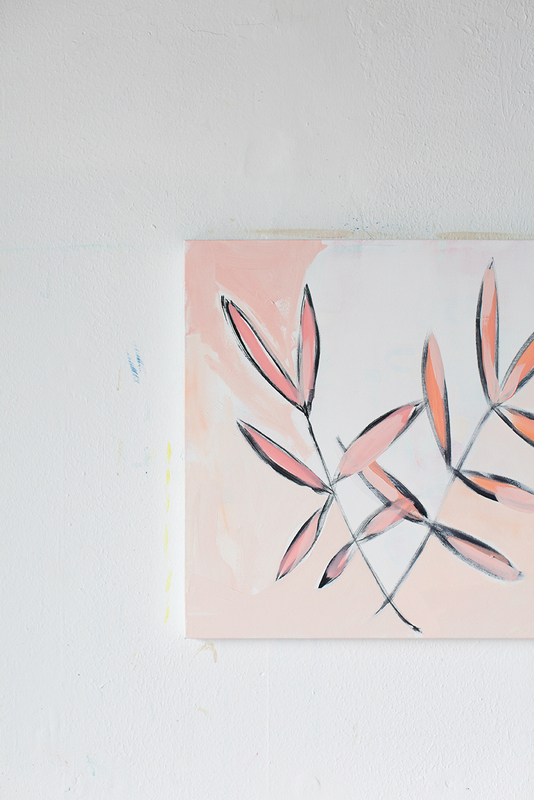 Because Britt is so experimental with color, she has developed a few habits that allow her to stay as organic in her painting process as she can. 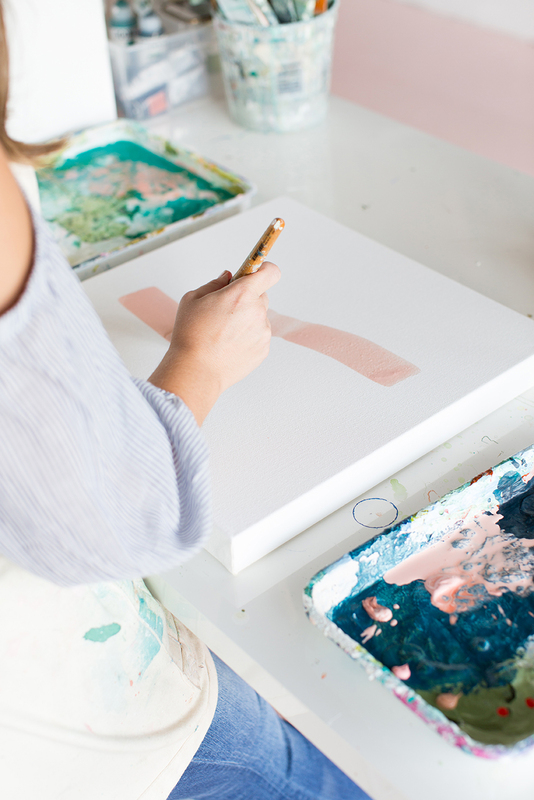 One of her favorite practices allows her to test out different color palettes without fear of permanently altering her progress if she is unsatisfied with the result. 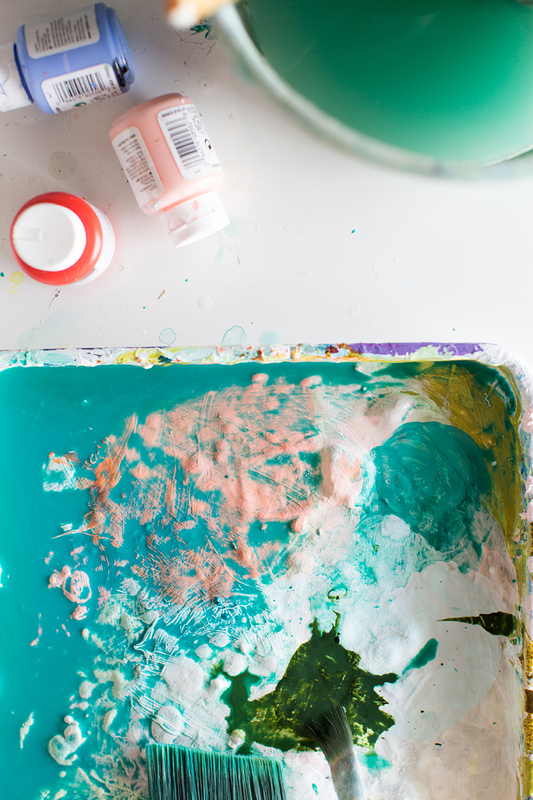 Because color contributes so much to how a piece is perceived and what emotions are evoked, it is important for an artist to be able to communicate exactly what they intend with color. Time has taught Britt a few habits that help her to accomplish just that. 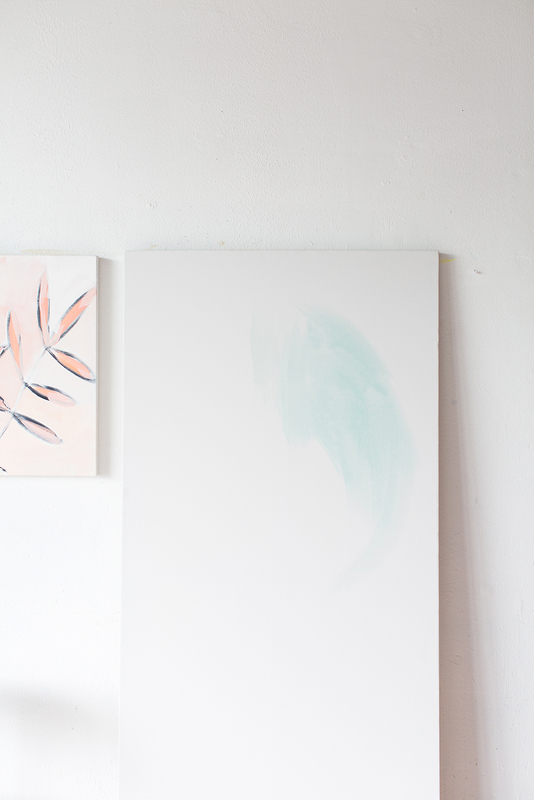 “My go-to is white paint. If I see a piece that I’m not pleased with, I’ll just start covering over areas that I don’t really love in white, starting with a thin white wash and if I really need to, I’ll go on thick. White paint is my safety eraser. 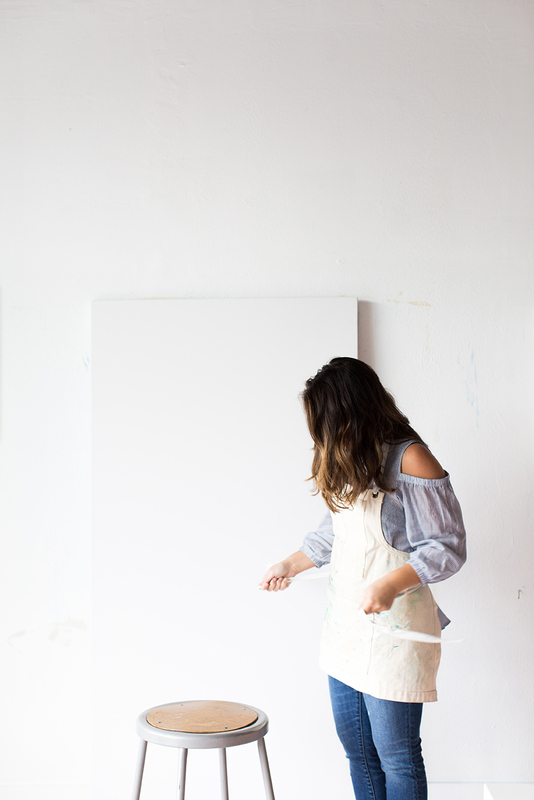 It’s a good reset button for me, especially if I’m getting super frustrated with a painting, I will literally just paint over the entire painting in white,” Britt explains. Over time, Britt has learned what practices work best for her in regards to her painting process, but she has also learned that to be a successful artist, there is a lot more that needs to be taken into account than painting alone. Running a business is difficult and time-consuming, but Britt largely credits her success to her mindset. “Looking back, I’m really glad I’ve gone for it one-hundred and ten percent without being afraid of failing. Knowing that it could fail, but not being worried about it. We’ve been fearless,” Britt remembers. Going after her dreams and believing in herself without hesitation has served Britt well in her business. She has surrounded herself with a strong support system including her husband, her family, and other accomplished artists who push her to be her best and do her best. But she knows that doing her best often means prioritizing her needs outside of work to create a well-rounded and beautiful life. Britt likes to wake up in the morning and eat breakfast with her husband, water her plants, hang out with her dog, and get a morning workout in. Once she has started her morning off right, she heads to the studio. 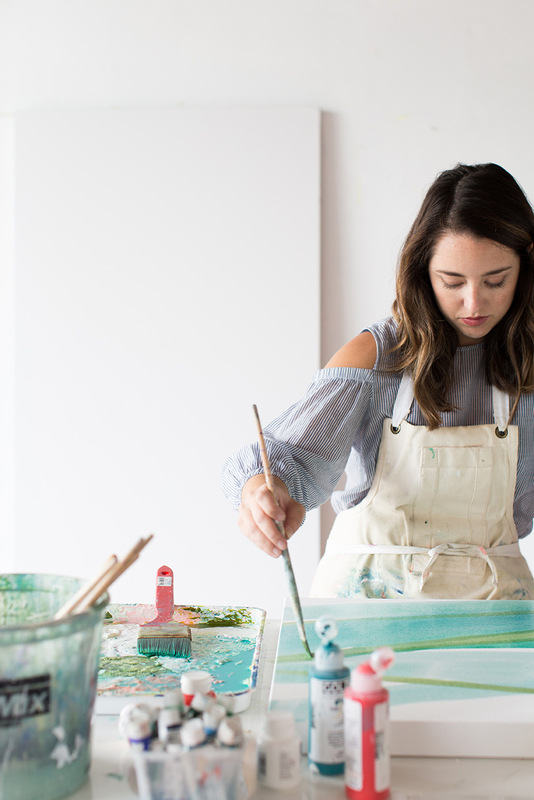 Day-to-day, Britt allows herself to delegate tasks like production and correspondence so she can have time to do what she loves—painting. Each day presents its own joys and challenges, depending on deadlines, shows, and projects, so no two days are ever the same. Britt is actively involved in all parts of her business, but she has also learned that to do what she loves well, it is best for her to let others take care of some details, freeing up her mind and time. After she leaves the studio, Britt spends time with her loved ones and enjoys relaxing with a good book and a glass of wine. She will often spend her evenings outside enjoying nature or staying home cooking dinner when she’s not traveling or exploring new places. Britt’s life outside of work certainly plays a large role in her success, but another undeniable contributor is her unique philosophy on inspiration. “I’m not the type of artist to keep a sketchbook full of notes, I subconsciously take things in. I tend to be a present-minded person. Wherever I’m at, I’m going to be one-hundred percent there. I’m not hyper-focused or structured on seeking inspiration, I’m more about enjoying myself while I’m out. When I get back to the studio, I’ll look through my photos, think about my time, and subconsciously make it into paintings,” Britt explains. Giving herself fully to her present circumstances allows Britt to be inspired on a deeper level, and subsequently, create on a deeper level. She often says that when she gets in front of a canvas, ideas just come pouring out without too much effort, and this is largely because of her rich and natural inspiration to creation process. Britt shares that often, through her natural process of inspiration, she will see a theme start to emerge. As she flips through photos or sketches, she will see commonalities appear among them. That motif is often what fans a spark into a flame and becomes the inspiration for a new piece or a new collection. This emotional quality shows so consistently in Britt’s work through the playful composition of shapes and choices of color, all placed with purpose and elicits a reaction by anyone who admires Britt’s paintings. Each painting presents a one-of-a-kind meaning and response to each person who views it. 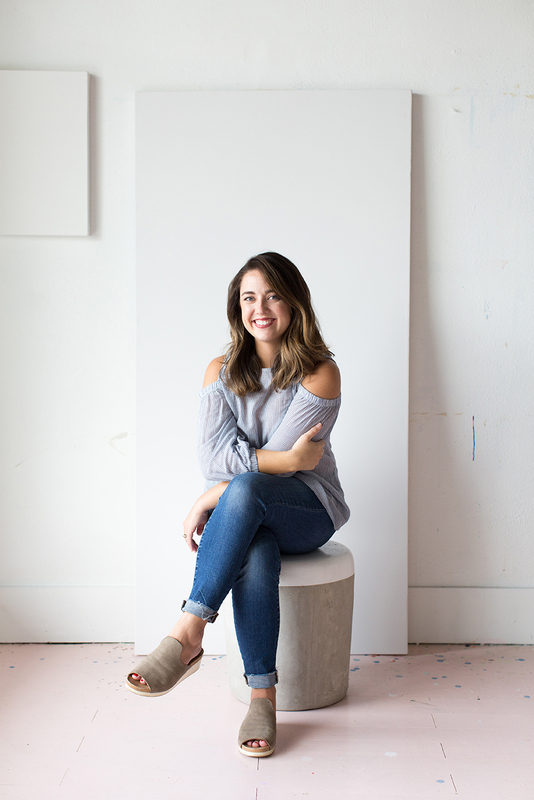 Britt certainly has a bustling day-to-day life in her studio, but that does not minimize the fact that she has big dreams and aspirations for the future of her business. She would love to continue seeing her work in unique spaces, on products, and in showcases. Time and fearless pursuit of her craft have beautifully evolved Britt as an artist, and her future points to the same vibrant pattern that has characterized her life and work so far.